Dental Crown Problems - What Can Go Wrong? Finding out that you can have dental crown problems AFTER you get you new crown (or crowns) can be an unwelcome surprise. When you've gone through a dental crown procedure and paid your money, you may feel entitled to feel like you should have a tooth that will be bullet-proof. Unfortunately, that's not how it works out every time. There are a few dental crown problems that can crop up after you get your crown fitted. Some of them might be preventable with good planning and high-quality materials. Other dental crown problems are just plain bad luck - nobody's fault. If your crown is the wrong color, your dentist should pick up on this when he's doing the trial fitting. Even if he thinks it looks OK, he should give you mirror, and let you see your crown in natural daylight before it fits it with cement. Sometimes he will think it's fine, but you might think it's a little too white or a little too dark. It's your crown. It's your choice. BUT this situation could be avoided in the first place. There are three options here; either the dentist will take several photos of the adjacent teeth so that the dental technician can get an idea of what dental ceramics to use to match the new crown. your dentist might use a fancy modern device that measures the color of your adjacent teeth by electronic color mapping. This can work extremely well. The FINAL option is for the dental technician to see your teeth himself, either by visiting the dentist office at your appointment, or by you visiting his laboratory for a color matching. So what happens if you don't like the color of your new crown? You must ask the dentist to send it back to the lab to get a color correction. He should be happy to do this for you. Sometimes the new crown just looks plain wrong - the color may match the adjacent teeth - but the new crown just doesn't blend in very well. It seems to stick out like a sore thumb that it's a crown and not a natural tooth. This is usually due to the crown being a little too bulky, or too big. This tends to show up some time after the crown has been fitted. It can be caused by a few things. The most common cause of the gum getting red and inflamed around a crown is excess dental cement being left behind. It can be a very small amount, just under the gum, but it will cause irritation. It's like having small splinter stuck in the skin of your hand. It's a foreign body, and your immune system reacts to it. The gum will become slightly puffy, red, and tender. The treatment to improve things is simply to remove the excess cement. Sometimes, if the cement is not stuck to the crown, it may be possible to remove it with dental floss. Otherwise, you'll need to see a dentist or hygienist, to gently remove the cement with a special instrument. It's normally quite simple. Obviously, the dentist should not leave any excess cement behind when he fits the crown. This is a preventable problem. The other main reason for gum irritation around a crown is plaque collecting due to either rough edges where the crown meets the tooth root, or else the crown is too bulky where it meets the gum, making it difficult for you to clean plaque off the crown properly. The only solution for this dental crown problem is to replace the crown with a new one, which is slimmer at gum level and perfectly smooth, with no gaps or spaces, where it meets the natural tooth root. Again, this problem can be prevented in the first place by making sure the crown fits the tooth root smoothly when the crown is fitted. This more of a quality-control issue. Both the dentist and the dental laboratory need to make sure that their work is up to standard to produce a smooth, well-fitting dental crown. There are 2 MAIN reasons for having pain after a new crown is fitted. The most common, BY FAR, is the crown being slightly too big where it touches the opposite tooth when you bite. We say "it's too high on the bite". Sometimes it's very obvious - when you bite down, you feel like you're only hitting on one tooth. Normally you notice this when the dentist is fitting the crown, and he will make some adjustments to correct it. BUT sometimes the high spot is minimal, or only hits if you bite in a certain way. If you clench your teeth in the middle, it may feel fine, but when you slide your jaw off to one side or the other (ie. if you grind your teeth slowly), you will become aware of the crown interfering with your jaw movement. The teeth don't slide over each other smoothly. In this situation, you will unconsciously start to grind your teeth right on the interference. The tooth under the crown takes a lot of pressure from this, and of course the nerve inside the tooth can become inflamed, causing pain. 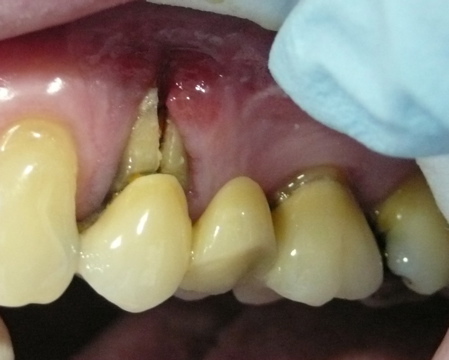 This dental crown problem can be prevented by the dentist and the dental laboratory both working to a high standard. It's not unusual for the dentist to have to make some small adjustments to the bite on a crown when they fit it, but that should be all. If you are still having pain after a few days, the dentist will need to make some more adjustments to get rid of the interference. Basically, he'll grind the biting surface of the crown down a bit. The OTHER main cause of pain after getting a crown fitted is the nerve becoming inflamed due to the tooth being drilled down too much. Sure the dentist has to trim the tooth down to make room for the crown to fit over the top and look like a natural tooth, BUT if he is trying to change the shape of a tooth (ie. maybe it's an eye tooth that sticks out too much), he will need to drill the tooth down more than usual, so that the lab guy can build up the crown to be more aligned with the adjacent teeth. This more aggressive tooth reduction may damage the nerve, resulting in toothache. There's only 2 courses of action here; first, wait for a few days to see if the pain settles down, OR if the pain is severe and persists for more than a few days, you will probably need root canal treatment to solve the problem. This problem is more unpredictable than the others, and it's not really possible for a dentist to guarantee that this won't happen. In fact, research shows that around 25% of teeth that get a crown will eventually need root canal - but maybe years later. This is probably due to the fact that most crowns are done on teeth that already have big fillings. The tooth has already had a lot of work done on it, and the crown is an attempt to prevent anything else breaking on the tooth. So now we are into the area of dental crown problems that cannot necessarily be avoided by planning and preparation. The remaining problems here are unpredictable. The biggest unpredictable problem when it comes to dental crowns is a fracture of the tooth. The position and angle of the fracture line is critical when it comes to deciding if the tooth is still restorable. Sometimes the tooth will crack straight across at gum level. Providing the fracture line leaves all the edges of the remaining root above gum level, it may be possible to restore the tooth and save it with another crown. On the other hand, if the fracture line goes under the gum edge at all, the remaining tooth will probably have to be removed. You can read more about this HERE. And you can read about the options for replacing the tooth at dental implant vs. bridge. SO, there are quite a few potential dental crown problems! Most can be avoided with proper planning beforehand, a high standard of treatment by the dentist, and a skilled and experienced dental technician. But sometimes problems can be unpredictable.